This Black History Month’s History highlight is none other than Martin Luther King Jr.
“Life’s most persistent and most urgent question is, “What are you doing for others?” -Martin Luther King Jr. This very quote is the platform for Martin Luther King Jr.’s stance in life. He believed in civil disobedience and that, in order to defeat evil, one must overcome evil with good. Martin Luther King Jr. was born January 15,1929, in Atlanta, Georgia. King was born into a Christian home; his father and grandfather were pastors in Atlanta for Ebenezer Baptist Church. It wasn’t a surprise that King continued in his family’s Baptist upbringing in ministry. Along with following in his family’s footsteps, King received a great education. King attended Booker T. Washington High School in the time when segregation was prevalent. Because of King’s intelligence, he had the opportunity to skip ninth and eleventh grade and was able to graduate from high school at the tender age of 15. He then moved on to Morehouse College in Atlanta. At this very university, he followed in his family’s footsteps and received a B.A. in Sociology in 1948. King was known for many things but one of the main things he was known for was protesting peacefully. King led the bus boycotts and was a part of NAACP (National Association for the Advancement of Colored People). Since King was a part of this organization, he was appointed to the lead the boycotts, was trained properly, and created a special bond in and within the black community. King was a remarkable man; he formed a group called the Southern Christian Leadership Conference (SCLC). The purpose of this organization was to create a moral influence as well as establishing dominance in the African American churches. This group, established in January 1957, consisted of 60 ministers, Ralph Abernathy, civil rights protesters who were the catalysts in the civil rights platform. This very organization helped King gain notoriety in the South. This non-violent campaign was expressed in the form of “sit-ins” where a number of people would go in segregated establishments and sit down even if they were denied service. Protesters were verbally as well as physically abused but slowly made a huge difference in many states. King was arrested for participating in a sit-in in Atlanta. 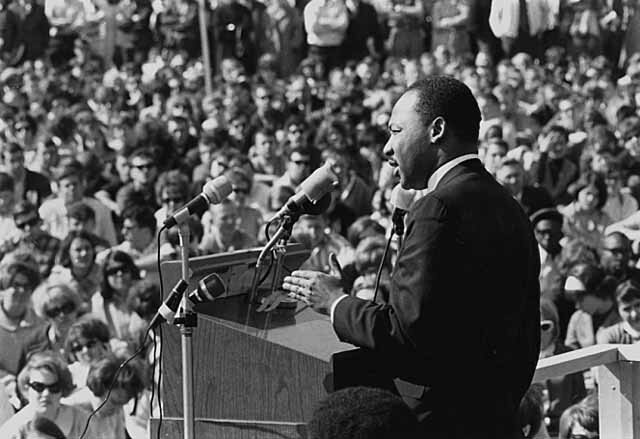 Among many other accomplishments, King left an impression through his speeches. In 1963, on August 28, at the Nation’s Capital, King led more than 200,000 in a march to Washington. On that very day, King gave his most famous speech, “I have a Dream.” This speech was almost futuristic in its approach because King gave his dream for the nation that he fought for in the means of equality. King received the Nobel Peace Prize in 1964 right after the enactment of the Civil Rights at in the same year. King still led marches that contained all races. King helped in establishing the Voting Rights Act 1965 and stirred strength in African Americans in such a hopeless time. Sadly, King was assassinated four years after the progression of rights for African Americans. This murder resulted in riots in over 100 cities in the United States.